2048 is a free-to-play numbers-based puzzle slider app game for iOS that offers players a bite-sized game play experience that is highly addictive, and once downloaded and installed on your iOS device is sure to be one of the go-to titles in your main game play rotation. Created by a 19-year-old Italian web developer named Gabriele Cirulli, the game is based upon a craft-puzzle game (literally a block of wood on which sliding squares are used to make numerical orders) but with a twist. In place of lining up numbers as you would in the game from which it gets its inspiration, the player instead combines like-numbers, the goal being to make a single tablet that totals 2048 - hence the name. Similar both in feel and addictiveness to the Sudoku-style of puzzle game, the point to play is not simply to create pairs to increase the tablet value, but rather is a combination of three different basic tactics - those being (1) to create larger and larger number tiles, while (2) maintaining a steady upward total and (3) refrain from permitting too many large tiles to trap the smaller ones. That may sound simple enough, but in fact it is anything but - as the further into the game you get, the more tiles are added. One of the most addictive free-to-play titles in the puzzle category! It has been said that imitation is the most sincere form of flattery, and to be sure there is a story here... This puzzle game is actually a take on more than the original crafts game, but also a mobile puzzle app called 3's (that sold for $2.99) that was very popular earlier this spring. The version that Cirulli created in addition to being free, also happens to take something of a different -- some even say more interesting and, perhaps of more significance, more satisfying -- approach. Considering that 2048 caught on like a wildfire, to the extent that it now has dozens and dozens of its own imitators (which is why we made the effort to identify the version we played for the review and this guide since we feel it is the best version available - that being the one by Ketchapp). 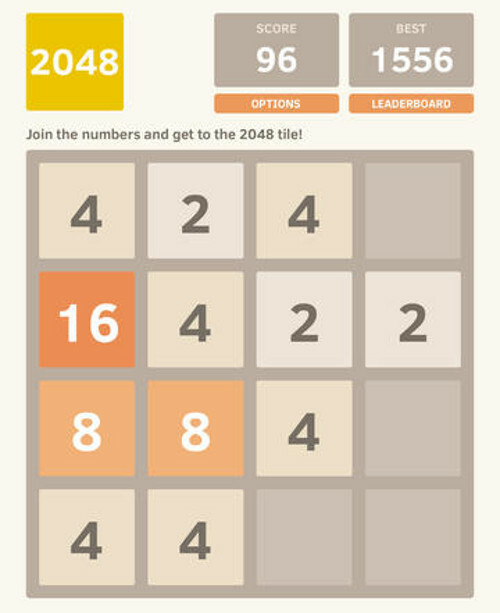 There is proof that imitation really is the sincerest form of flattery, but the bonus to that saw is that the games that have come out that are like 2048 are not all purely imitations - many of them take the new approach that 2048 introduces to the 3's style game and add their own take and mechanics to it. That being so, you just may find that 2048 is the pure form of the game, but other versions offer additional game play attraction. We're just saying.